If you know me, you know that I am a huge zombie fan. The Walking Dead is one of my favorite shows, I love zombie movies, and October is one of my favorite months, for several reasons… one of them being, all the horror movies, which of course includes zombie movies. Oh, and the Halloween candy, desserts, zombie pasta, and… candy. I have such mixed feelings about Negan. I mean his character is a very bad man and I’m going to hate him, but I’ve had a celebrity crush on Jeffery Dean Morgan for years. I’m more fond of his pre-losing weight and looking too thin (which has made him look older), look, though. via GIPHYAlthough I love him as a good guy, I think he makes an excellent terrifying mean horrible bad guy with the character Negan. To get in the spirit of October, Halloween, and all things spooky, I’ve been trying out recipes fitting for the occasion. It’s easy to come up with desserts and drinks, but entrees aren’t as easy, at least for me. 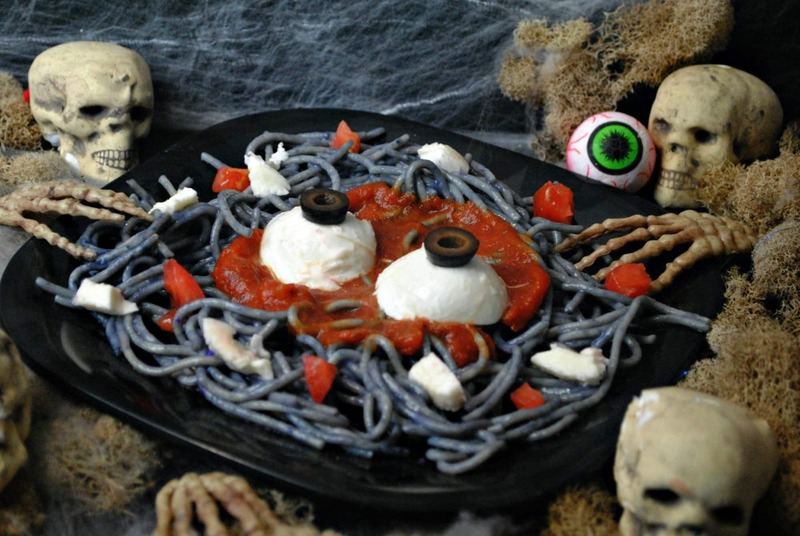 After thinking about it, I thought spaghetti would make a great creepy food for a Halloween entree recipe. The results, Zombie Pasta. Or Spooky Spaghetti, Putrid Pasta, Scary Spaghetti… you get the picture. In a large pot put 4 quarts of water, 1/4 tsp. black food coloring and 1 tsp. salt. Add dry spaghetti and return to boil. Cook uncovered for 10-12 minutes, or until tender. Make sure to stir occasionally. Remove from heat and drain in a strainer immediately. Add olive oil to the cooked pasta. This allows the pasta not to stick together. Top the spaghetti with your favorite pasta sauce. Place to fresh mozzarella balls in the center for the eyes. Add to olives to be the pupils. Now add chopped tomatoes and mozzarella and sprinkle around the dish for body parts and blood. NOTE: The food coloring on your pasta won’t stain your mouth and adds no additional flavor. 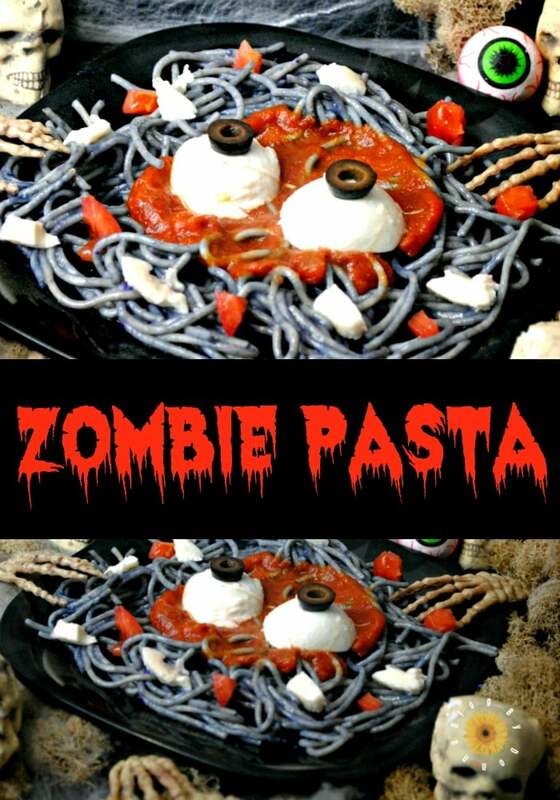 I hope you’ll give this Zombie Pasta dish a try; I bet your kiddos will love it this Halloween. This recipe will be perfect to make on October 23rd for the season premiere of The Walking Dead. Oh, and check out this Bloody Bones cookies recipe for dessert. Are you a The Walking Dead fan? Who do you think Negan’s Lucille kills?